Long campaign to bring 'stumbling project' project to humanize Holocaust victims in Munich rejected - with the Jewish community's support. Munich Wednesday gave its approval for plaques for individual Holocaust victims to be installed throughout the German city but upheld a ban on Europe's biggest memorial project after months of anguished debate, according to AFP. The decision by the city council in the birthplace of the Nazi movement will pave the way for some Holocaust victims to be honored with personalized brass plates at their last-known addresses. 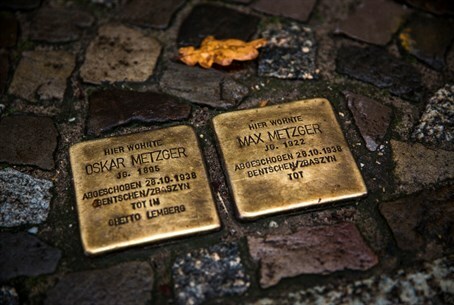 However a long and emotional campaign to bring to Munich the two-decade-old Stolpersteine (stumbling blocks) project, in which coaster-sized brass plaques are embedded in the pavement in front of the victims' former homes, was voted down. Sculptor Gunter Demnig started the project in 1996 to bring the unfathomable dimensions of the Holocaust, in which six million Jews were slaughtered, down to a human scale. About 54,000 Stolpersteine have been laid in more than 1,200 cities and towns throughout Europe including 500 German communities, with the exception of Munich. Demnig's supporters argue that their placement on public property keeps the memory of the Holocaust alive by confronting pedestrians with the fates of individual victims more than 70 years on. The Bavarian capital's community of about 10,000 Jews was purged by the Nazis. A petition against the ban on the Stolpersteine on public property in Munich has drawn nearly 99,000 signatures but the majority on the city council was swayed by Knobloch's objections. Wednesday's decision will instead permit plaques on building facades, if owners give their approval, and atop posts set up on public ground. A central memorial listing all the victims' names is also planned. A group of Jewish concentration camp survivors and victims' families said in a statement that they would launch legal proceedings against the Stolpersteine ban. "Justice will prevail. Many of us will, sadly, no longer live to see the day," said Munich native Ernst Grube, 83, who survived the Theresienstadt camp in what is now the Czech Republic and lost several family members to the gas chambers. Munich, Germany's third largest city, has struggled to come to terms with its Nazi past and only this year opened a museum on the site of the former Nazi party headquarters.